:: clevergirl.org ::: 114. I didn't win! Do you see how my post numbers are a little out of order now? I started this post last week or so but didn't finish and publish it! So here we go! I didn't win the PatternReview.com refashion contest, in which voting ended on Feb 11. In my concession speech, I must thank all of you who commented on the dress and voted for it. :) The dress may have lost the battle, but it's nice to see that we're gaining ground in the war for "green" sewing and sustainable style. One of the 1st place gals made a Vogue/ Michael Kors jacket from Capri Sun bags! I doubt she will wear it to Sunday brunch, but that, combined with projects such as this excellent blue wool coat refashion, do a lot to open our eyes to the potential of the very clothes and materials already sitting, unused, around us. 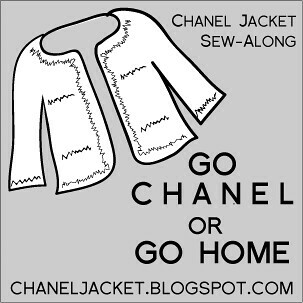 The official word from PR in the last newsletter is that there was a tie for first AND second place, so technically the blue coat would have been next in line and then my Chanel knock-off? I guess? Any which way, it was a great experience to prepare for and hit a deadline, knowing my work was going to be judged and scrutinized. And it was fun reading the comments about the dress because it wasn't really that hard at all. A couple of folks asked for a tutorial, which I'm happy to oblige... after I finish the other tutorial I already started! I'm about halfway through and should finish by the end of this week. Hope you are enjoying pre-spring, even those of you in the snow! What do you think Michael Kors would make of the winning design? I think your refashion is just gorgeous and a winner in its own right. That is confusing! I get to browse through Pattern Review much through the school year, in the summer is when I read it regularly. Otherwise I would have voted for you!